Above is the first organ Ernest Flagg designed for Frederick G. Bourne's 'Indian Neck Hall' designed c. 1897-1900 in Oakdale. 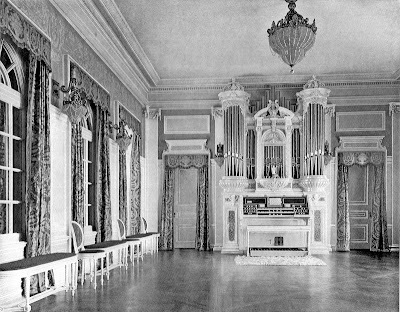 After Bourne had Flagg add a ballroom he also had his organ enlarged (c. 1908). Click HERE for more on 'Indian Neck Hall'. Photos courtesy of Jim Lewis. That ballroom is enormous!!! Good grief. That's not a ballroom, that's a grand concert hall. funny to see the original 'little' organ imbedded in the huge new one.